Oregon Rediviva | Oregon Historical Society Rediviva? The Oregon Historical Society has a substantial, but temporary, new revenue source, thanks to the recent vote of Multnomah County voters. I voted for the levy, but I did so with many misgivings. First: for the past decade, the Society has strenuously avoided telling its membership, and the state legislature, and the general public, just what it proposes to do with itself. Now, in extremis, it still has no vision, no plan, no articulated ambitions, no stated sense of its duties or obligations. If the Society doesn’t soon form some plans, and articulate some goals, it stands little chance of getting an extension on this extraordinary levy. This is a one-time opportunity. Second: the Society has spent the past decade squandering its resources. It has made a number of dubious financial decisions. It has carelessly dismissed its intellectual capital, the expert staff that was its claim to respect. It has kept both its membership and the public at large in the dark as to its precarious position. It has overtly thwarted efforts to bring light to that situation, or to engage its membership in any discussion of its future. This closed and aloof behavior does not bode well for the Society’s continuance. Third: despite the provisions of an oversight committee for the county levy, the management of the Society remains in the hands of a large, self-selected, often uninterested, and exceedingly unwieldy board, and of a caretaker director. While the board and the director deserve credit for devising and promoting this innovative levy, they must now prove that it was worth their efforts. Will the Society that evolves in the next five years be an organization that deserves continued support? Will the Society use this short-term levy as a platform from which to rebuild a tattered reputation? 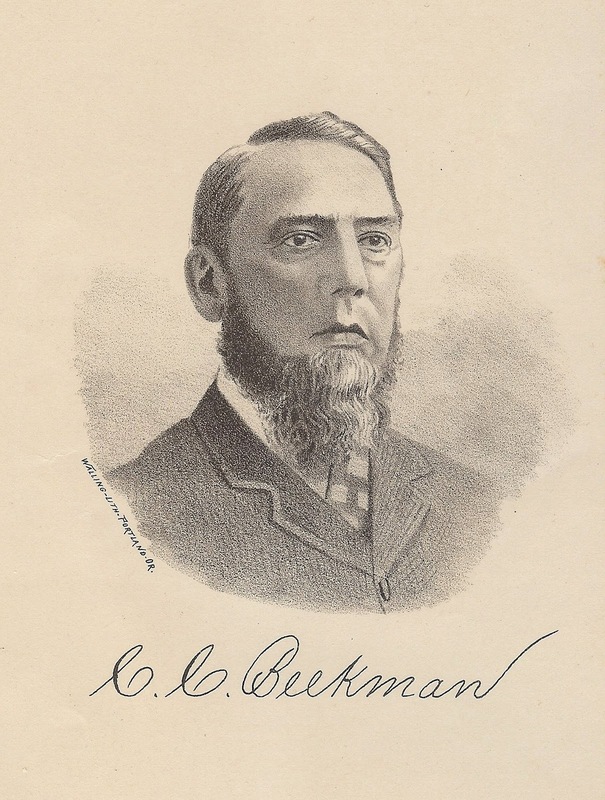 Cornelius C. Beekman (1828-1915) was a small-town banker, express agent, stationer, and philanthropist. He lived in Jacksonville from about 1855 until his death. He was a reluctant Republican candidate for governor of Oregon in 1878; though he refused to campaign, he lost the election by a mere 47 votes. Beekman served for several years on the board of the Oregon Historical Society, and willed his private bank building and its contents to the Society. For many years, the Society awarded a Beekman Prize for the best article in the Oregon Historical Quarterly. Benjamin B. Beekman, son of Cornelius, endowed a chair in history at the University of Oregon in his father’s memory. Papers relating to Cornelius C. Beekman and his family, his business, and his charitable activities are in the collections of both the Oregon Historical Society research library, and the University of Oregon Libraries. You raise some great points, Richard — thanks for this. I truly hope the OHS management takes this opportunity to look beyond the immediate, emergency situation recently ameliorated by passage of this levy and put in the time and effort to develop an inclusive and sustainable strategic vision. Reaching out to the many constituencies that you list should be their first step in this direction.